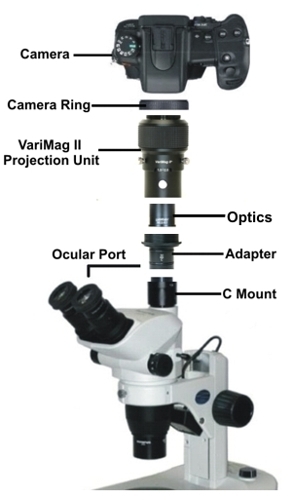 VariMag II is the most versatile microscope camera mounting system available for DSLR type cameras. It easily mounts your DSLR camera to most microscopes and provides a sharp, flat field of view with continuously variable magnification for perfect framing of your shots. The system includes fittings for mounting to any C-Mount or C/S-Mount trinocular, as well as any common 23mm, 30mm or 30.5mm Ocular Port. This modular system includes as standard equipment two easily interchangeable optics cartridges providing the widest magnification range in the industry. The optically tuned four element multi-group optics were carefully designed for the least amount of chromatic and geometric aberration. Each optical surface features multiple anti-reflection coatings for superior contrast and scratch resistance. Every optical and mechanical aspect of the VariMag II system has been carefully designed and manufactured to insure the optimum optical integrity of the overall system. The VariMag II system was designed from the ground up for use with DSLR type cameras, it is not a modified “compromise” of a point & shoot type camera adapter like some others. Don’t be fooled, no system can truly work well with both types of cameras. A DSLR camera can always achieve superior results over a point & shoot type camera since you can remove the camera lens. No matter how good your camera lens may be it is designed to shoot into open air and has no business being connected to a microscope. 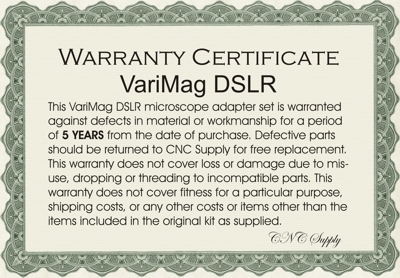 Just think of VariMag as a very specialized camera lens designed specifically for shooting into a microscope. I'm shopping for a DSLR, any suggestions? We personally like the Canon EOS series but many brands will fit and work just fine. We do suggest you get a camera with a "Live View" feature for easy remote viewing and operation. Some cameras come standard with the required software and others make you purchase it separately. There are also specialized software packages available for more sophisticated applications. Note that some entry level Nikons will not meter light without a lens attached, in this case manual exposure adjustment is normal. What Cameras will it fit? VariMag II works with virtually any SLR or DSLR type camera. We now also stock versions for popular "MIL" cameras such as the Olympus PEN, Sony NEX and Nikon 1. One camera adapter ring of your choice is included with each system. We have additional rings for all popular camera models available separately (and inexpensively). Thus VariMag II can be used with any camera brand that may be available in your lab. In addition you will not be locked into using one brand of camera as with many other adapters. We update our ring selection regularly as new cameras reach the market so your VariMag II system will not become obsolete when you decide to upgrade your camera. Many adapters lock you in, forcing you to repurchase the entire setup just to use a different brand of camera. What Microscopes will it fit? VariMag II includes a 3 piece set of modular adapters for attaching to most microscope models. As supplied VariMag II will mount to all microscopes with a standard 1x C-Mount (or C/S Mount) trinocular port or standard 23mm or 30mm trinocular ports. It will also mount to the ocular port (temporarily replacing an eyepiece) of any microscope accepting standard 23mm, 30mm or 30.5mm eyepieces, so a third port is not a requirement. It can even be used on microscopes having a single port. For reference a C-Mount is a 1” diameter male thread. To verify your ocular port size simply remove an eyepiece (it may be secured with a small screw in the side of the holder) and measure the inside diameter of the port (or lower eyepiece barrel). The modular system prevents your VariMag from becoming obsolete should your microscopes change. It can also be easily shared among multiple microscopes. Setup and installation of the VariMag II is quick and easy. Reconfiguration for a different camera or microscope also takes only seconds. Setup is as easy as 1-2-3. 1. Select the optics cartridge with the desired magnification range and insert it into the bottom of the VariMag II body. 2. Select the modular adapter for mounting to your microscope and thread it onto the bottom of the VariMag II body. 3. Thread the Camera adapter ring onto the top of the VariMag body and mount to your camera just like a lens. That’s it, you’re ready to start imaging. Focusing is performed with the microscope focuser. VariMag II also has a built-in parfocalization feature so you can exactly match the camera to the eyepiece at your most commonly used magnification setting. In most cases minor refocusing may be required when changing magnification. One of the valuable features of the VariMag II system is being able to vary the magnification of the image at will. This allows you to perfectly frame your shots, and most importantly to do it at the maximum resolution available from your camera. Using a fixed adapter you would have to import the image to your computer, and zoom in on the image. This significantly lowers the resolution of the image and causes loss of detail. The unique VariMag II system lets you vary the magnification in 2 ways. Think of it as Coarse and Fine magnification control. Coarse: The magnification “Range” is determined by selecting the proper optics cartridge for the desired magnification range. The VariMag system includes as standard equipment (2) optics cartridges. One covers the 1.5x-2.5x range and the other covers the 2.5x-3.5x range. There is some overlap designed in, so there are no “holes” between magnification levels. Fine: By adjusting the VariMag II Projection body you select the actual magnification level within the above range. The magnification factor is indicated on the scale. Continuously variable magnification lets you frame your subject exactly as desired for the clearest documentation. How do I figure Magnification with a Camera? The magnification range of the Varimag II system is 1.5x-3.5x. These figures are based on a comparison to a standard 10x eyepiece. At it's minimum 1.5x setting you would be imaging at 1.5x the magnification seen in a 10x eyepiece. So if your eyepiece view is for example 100x, your camera view is 150x. Or in this same example If the VariMag II were set to 3.5x you would be imaging at 350x. A minimum magnfication of 1.5x is required to fill the field of view of the camera, that is why the minimum magnification of Varimag II is 1.5x. Mounts of less than 1.5x will typically have vignetting issues (the illuminated image is not large enough to fill the image frame of many cameras causing a dark ring around the image). *Magnification levels given are for cameras with a common APS-C sized sensor and are based on what you would see looking into a 10x eyepiece of the same magnification. If your DSLR has a larger sensor the magnification range will be shifted slightly lower. If your DSLR has a smaller sensor the magnification range will be shifted slightly higher. If using a C-Mount figures are based on a 1x mount. Lower magnification and some vignetting may occur if used on a .5x C-Mount. Vignetting is dark corners around an image or in extreme cases a dark circle around the image caused by shadowing. Vignetting should not be an issue if using an APS-C sized sensor on a 1x C-Mount or Ocular Port. Getting a nice flat linear field of view that can be used for measuring is the downfall of many other adapters. They often have lots a spherical aberration due to poor optical design that gives a pincushion effect to the image. Since the field is not linear measurements are worthless. VariMag II was designed to produce nice even, flat linear fields of view that can be calibrated and used for measuring. The variable magnification feature even helps you calibrate to a known scale since you can raise or lower the magnification to exactly match the required scale. Can I use my SLR “type” camera with a non-removable lens? No, VariMag is compatible only with cameras having a removable lens. Contact us for other solutions. My microscope has a “CS” Mount will this work? Yes, C and CS Mounts are identical except for a small change in spacing. The VariMag II system includes mounts to fit both. My microscope has a .5x (or any reduction factor less than 1x) C-Mount will this work? Using a C-Mount less than 1x may result in some vignetting at lower magnification settings on larger sensors. Please see our "C-Mounts" page for common 1x C-Mounts. A C-Mount with a reduction lens is typically designed for cameras with very small CCD chips. The larger chips used in DSLRs will vignette because the reduced image is not large enough to fill the sensor frame. Who makes the VariMag II System? VariMag II is a Modern Photonics product. Modern Photonics has been designing and manufacturing professional camera mounts for over 15 years and has supplied well over 20,000 professional camera mounts to virtually every prestigious University, Lab, and Observatory in the world as well as to many individuals, hobbyists and corporate customers. Our mounts have been used in critical applications by NASA, Sandia National Labs, the US Army and US Air Force just to name a few. All VariMag systems are warranted against defects in material and workmanship for a period of 5 years from the date of purchase. Send us your defective part for free replacement. We also offer discounted replacement parts for our verified new product customers who have lost or damaged a part of their system.